Some of the Edinburgh's Christmas festivities in East Princes Street Gardens are being extended for a further five days. 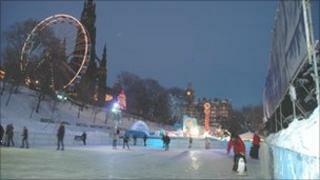 Edinburgh's ice rink and the Christmas fair in the gardens will now stay open until Sunday 9 January 2011. The ice rink will now stay open from 1000 GMT to 2000 GMT (Sunday to Wednesday) and 1000 GMT until 2200 GMT (Thursday to Saturday). The Christmas fair will open from 1000 GMT to 2200 GMT between 5 - 9 January.